We skied down from here and higher to Emerald Lake (below) on our second day (Sunday). Slope is < 25 degrees. Last weekend with snow pouring on the Sierra all week EVERYONE was going out skiing, but I wasn’t going to get stuck in Tahoe traffic or waiting in a lift line. 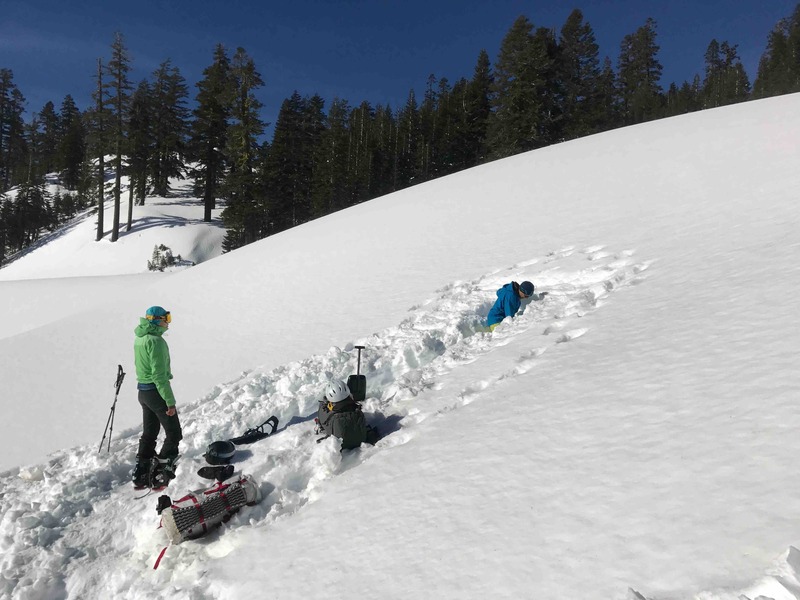 No, ten extra feet of snow at Lassen Volcanic National Park meant we were going out for three day backcountry ski adventure where we would sleep in snow caves and ski down untouched powder in low avalanche conditions. This trip had no real objectives besides having a good time and building some skills. 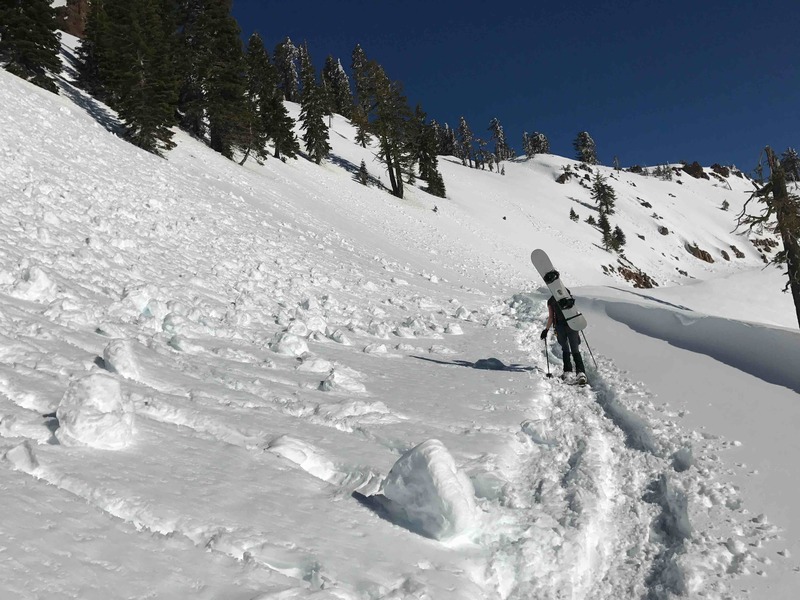 I’m still pretty new at skiing, so no bombing down double black diamonds or survival skiing down the ice on Lassen Peak. We drove out to Lassen early on Saturday and got a late start on trail around noon from the main Kohm Yah-mah-nee visitor center. (Late starts would be the norm on this lax trip) We skinned up the road and then decided to take a variation of the Ranger Shortcut starting just after the boiling mud pot (map) to save some miles. However, we ended up following a ski-track up to Diamond Peak instead of the more easily graded shortcut. 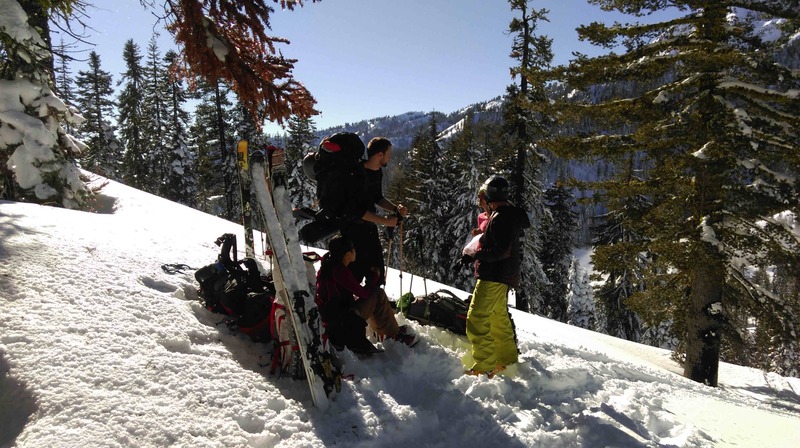 Taking a break to eat some food after skinning almost all the way up to Diamond Peak. I had a bit of a problem here and on other steeper ski-tracks sliding backwards on my skins as I tried to make upwards progress. This was compounded near trees or sun-scorched slopes where my weight simply caused more sliding on the couple inches of snow between the surface and a solid ice layer. I tried to solve it by breaking my own trail slightly off the track, often on a less aggressive gradient, taking shorter movements and moving more slowly when weighting my front ski. Someone noted that it might also have been that my rental skins didn’t completely cover the bottom of my skis. Given most of us were newer to backcountry skiing, this shortcut up diamond peak took us a little longer than expected. When we reached the road again we only went about half a mile until we broke off downward from the road and started construction on our snow caves. One two-person and one three-person. Directed by our expert Sadie, we followed a process a little different than what I read in Freedom of the Hills. 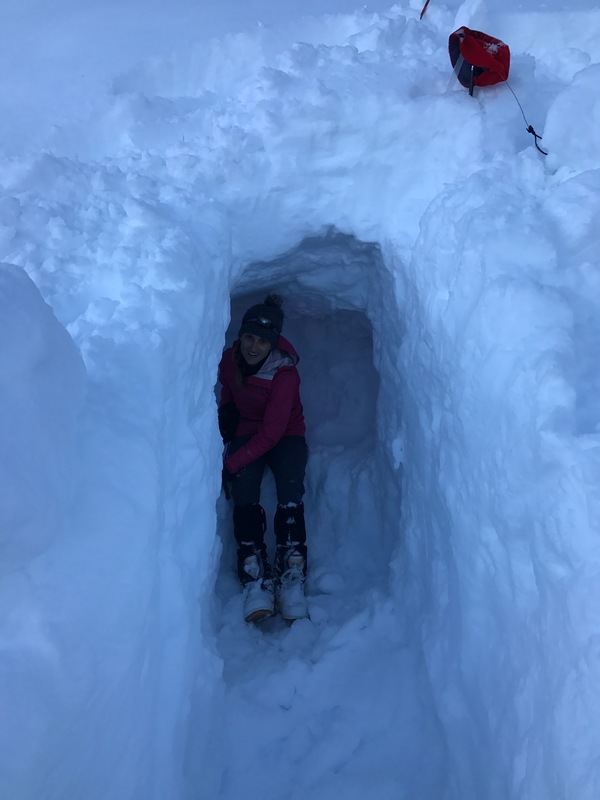 Start by digging a vertical shaft into the side of the snow until it was head level. Wait 30+ minutes for blocked up wall to bind together. Sadie excavating our sleeping platforms. The opening in front is that vertical slot you start with. What things looked like after blocking up the shaft and digging the entrance hole. For some obscure reason, growing up in Minnesota has endowed a love of shoveling. As such, snow cave construction was really enjoyable. A snow saw was essential for cutting through at least one, one inch thick ice layer. A few other tips I learned from construction were that you should measure that your sleeping platform base to the entrance floor is at least six inches deeper than you are tall on your hands and knees to more efficiently keep your heat inside the cave. Also, bringing a tarp or something else waterproof is essential to keep your sleeping bag dry if you touch the walls at all. An emergency bivy works perfect for the feet. In all construction took 2.5 hours and brought us into night, warm meals, party hats and celebratory birthday wine. 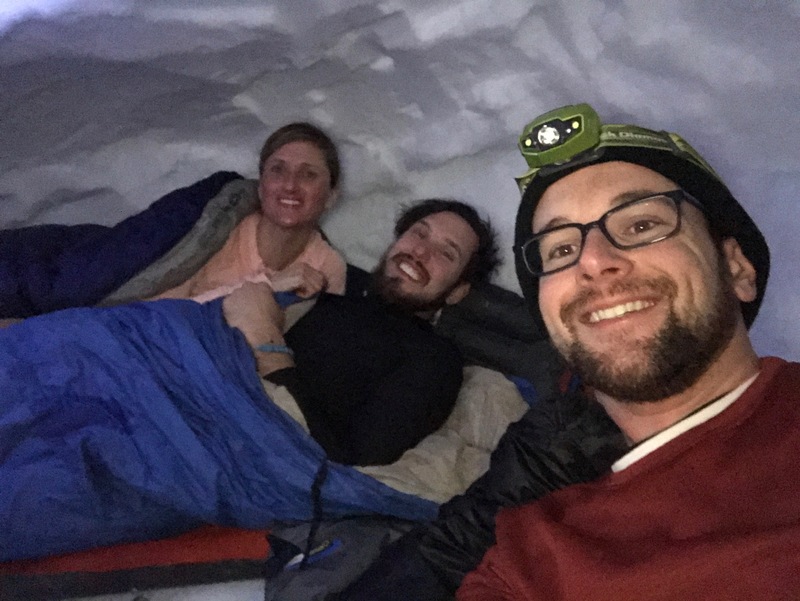 We are all comfy in our snow cave! 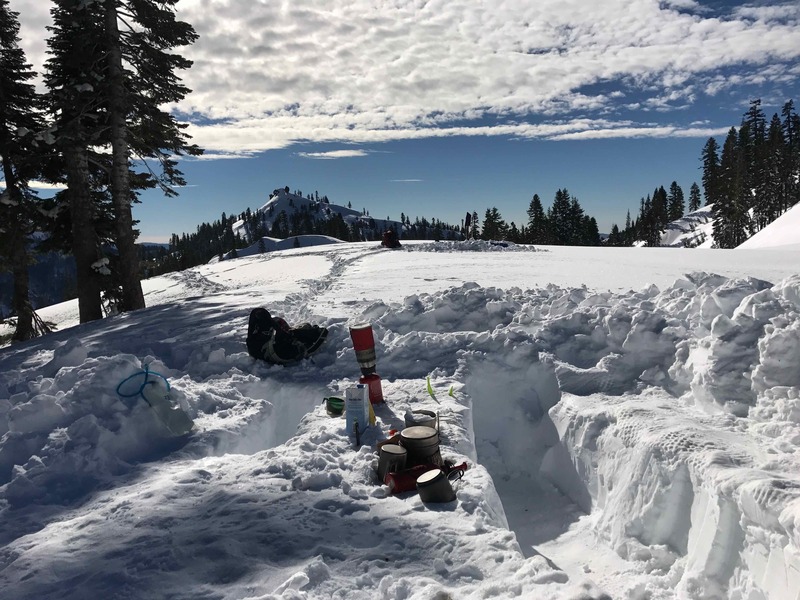 The next day (Sunday) we skinned up a couple miles to Emerald Lake near Lassen Peak for some easier terrain. All avalanche prone gradients showed roller balls which was helpful in avoiding hazards while picking an area to ski. Many rollerballs down the steeper, avalanche prone slope on the road towards Emerald Lake. With another late start we only got a few runs in but it was pretty awesome skinning up several hundred feet and skiing down through trees. The last time I was here I linked like one turn in the heavy, wet backcountry snow. This time I linked most turnsas I went through trees and varied snow quality from ice crusts to powder pockets. This was our kitchen for the weekend where we melted water and cooked our meals. Our last day (Sunday) we took our time to collapse our snow caves so they were not a risk for other winter travelers. Half of us took the Ranger Shortcut back, mostly traversing left midline along Diamond Peak. It was interesting skiing with a medium weight pack (30 lbs?) but with it strapped down tight it didn’t throw me off that much. There was one funny incident where I skied in and out of a divot and the higher center of mass provided me a face plant as I tried to keep my tips up coming out of it. Henrique working on collapsing his cave with a saw. Another great trip at Lassen, learning more every time. I just wish renting back countries skies wasn’t so expensive. Now enjoy a video of me falling to my cave while collapsing it.